Pepper Lunch will be giving 50% discount on May 12, 2010 if Netherlands become the 2010 World Cup champions. 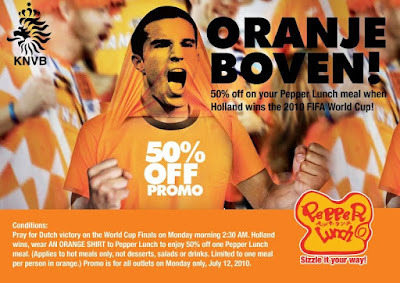 This is a unique promo and only those who will be wearing an orange shirt will be able to avail of the discount if the Dutch become world champions. All Pepper Lunch branches will give the 50% off on a Pepper Lunch meal and will limit the discount to one meal per person in orange. Like what my wife posted on FB, I surely am thinking positively and am cheering for Netherlands. When Oranje become champions, the whole family will be going to Pepper Lunch to avail of this promo. 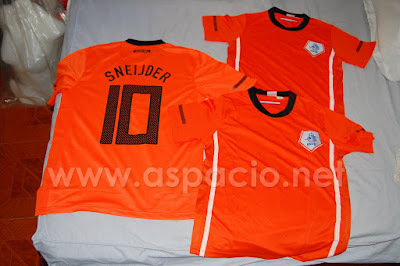 We will be wearing our Netherlands 2010 World Cup home jerseys. Never mind that many of the players of the Dutch are quite old and experienced (not old enough to need some prototype 37-c cream). They have been in a very long winning streak and are just about to reach the climax of their campaign on the 12th! Go Oranje!